I am a self-proclaimed lover of movies, but anytime you hear me talk about a movie I have recently viewed, it will most likely be old news to most of the world...because I am cheap. I very rarely see a film in our expensive theater when it first premiers, instead opting to sink into the 30-year-old seat of our 'cheap theater'. 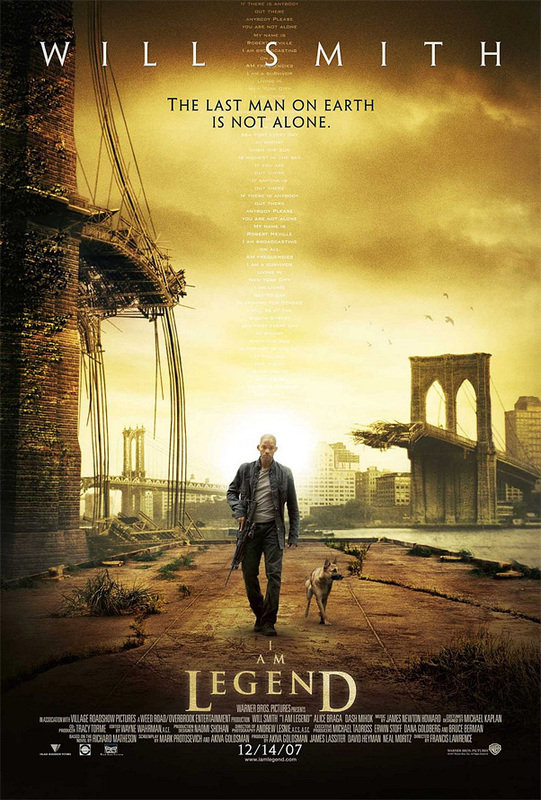 My wife and I saw the movie "I AM Legend" on Friday night and I have been thinking about it ever since. It was a very suspenseful movie (a bonus for me as Mandy and I cuddled while she hid her face in my shoulder for the scary scenes) and had an interesting plot, but I felt unsure as to my opinion after it's culmination. I was left with a lot of unknowns and wasn't clear if I approved quite yet. The more I think about this flick, though, the more impressed I am with it. The movie has very clear spiritual implications as the theme of Jesus Christ runs through the entire plot line. In short: the world had fallen into a time of "darkness" as humanity had thought they could control the metaphysical, the transcendent, but proved themselves wrong. In the end, the "Savior's" blood saves the world from it's ultimate demise as "light overtakes the darkness". Even the title of the film seems to have a biblical ring to it. After the movie was over I couldn't figure out why it was titled "I AM Legend", but after thinking through the messianic theme of the movie, the reasoning dawned on me. The movie is the 'Story of God'. In Exodus 3 God tells Moses that His name is simply "I AM" (all CAPS). Also, a legend is simply another word for a story. So, the title really refers to the "Story of God'. I highly recommend this movie and look forward to watching it again myself as I look for other ways in which the "story of God" appears throughout this film. I think Mike and I should take in another flick opportunity with you and Mandy and possibly coffee somewhere in there as well...I know, finding the time is the issue.